An outdoor security camera can act like a crime deterrent by letting potential criminals know that we are serious about protecting our homes from crime. If you run your business out of your home, you probably already know the value of a good security system. We protect our computers from viruses. We protect our files with passwords. We protect our cars with alarms. It just makes good sense to protect our homes and our home businesses with an outdoor security system. 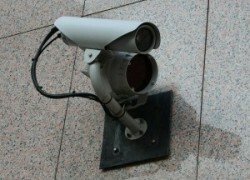 Here are several advantages of protecting ourselves with a wireless outdoor security camera system. An outdoor security camera can act like a crime deterrent by letting potential criminals know that we are serious about protecting our homes from crime. Install your outdoor security camera systems where they can be seen but are hard to get to from the ground. Post a sign that is clearly visible, letting people know that you have an alarm and security in place and operational. Taking these steps may prevent anything bad from happening to your home, possessions and loved ones. A wireless outdoor security camera is easy to install because it requires no cables. Running bulky cables is not only dangerous; they are unsightly and can be sabotaged much easier than a wireless outdoor security camera. You can easily monitor your entire yard and outside perimeter from your own home computer. Many systems come with a DVR. Today’s wireless outdoor security camera system is easier than ever before and well worth the money. Real estate agents will often add an inexpensive yet easily upgradeable security system for potential real estate leads in order to increase the value of the home in their eyes. A wireless outdoor security camera system not only increases the value of your home, it easily pays for itself in the lower insurance premiums that you will have to pay every month. Many people will purchase one outdoor security camera for each corner of their home, which is usually more than enough to cover your entire yard.